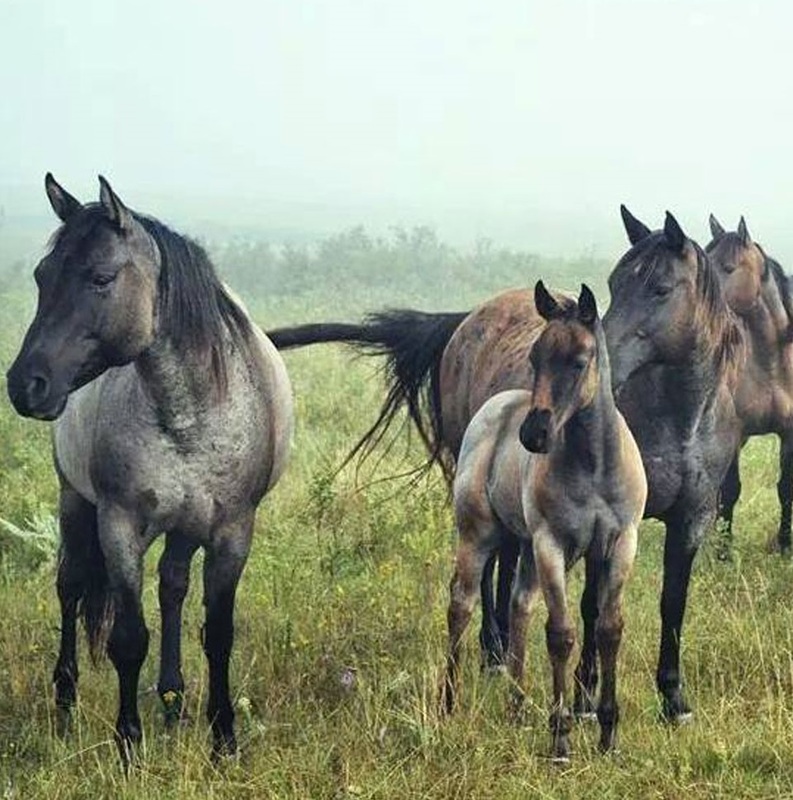 Lance & Sunshine Froelich personally invite you to experience our tremendous set of broodmares, foals, and stallions in the scenic southwest North Dakota Countryside near Shields, ND. Years of selection has allowed us to provide our customer’s horses with world class disposition, conformation, and roan genetics. Froelich Quarter Horses is a recipient of the American Quarter Horse Legacy Award and our foals qualify for the AQHA Heritage Breeders program. John Froelich registered his first foal in 1947. Beginning in 1959, Froelich Quarter Horses consecutively registered at least one foal a year. In 2009 Froelich Quarter Horses received the American Quarter Horse Legacy Award in recognition of 50 consecutive years of registered quarter horse foals. Grandson of John, Lance, now continues to carry on the legacy by privately selling AQHA foals from the ranch. With no annual sale Froelich Quarter Horses can provide their customers with horses Private Treaty sales anytime of the year. In the late 1920’s Matt & Katherine Froelich moved their farming and ranching operation from southern Morton County to Sioux County on the Standing Rock Indian Reservation. Like others of that time, Matt’s farming and ranching was dependent on horse power. Matt raised draft horses, they were known for their quality. In the 1940s Matt & Katherine’s son John and his wife Barbara purchased the holdings of his parents and continued to add to the existing ranch. Like his father, John had the desire to raise horses. He started raising Quarter Horses in the late 1940s. He was especially known for raising quality palomino quarter horses with speed and cow sense. Through the years John used the bloodlines of Comanche Boy, a maternal grandson of legendary Oklahoma Star, Smutty Bill, Mr Blackburn, a grandson of Pretty Buck, Real Baron Jack, son of AQHA champion Baron Bell and Legendary Hall of Fame Two ID Jack, Tuffernhel & others to enhance his Quarter Horse Bloodlines. In 2009 Froelilch Quarter Horses received the American Quarter Horse Legacy Award for 50 consecutive years of registering at least one foal. In the 1970s John’s son Rod and his wife Kathryn purchased the home place, some years later they added to the ranch by purchasing land from the Port family. The second part of the ranch is located on the Cannon Ball River. Rod & Kathryn have been utilizing the bloodlines of Two Eye Jack and Joe Quincy to enhance the cow sense and dispositions of their quarter horses. Together with their sons, Lance and Chase, they own and operate some of the current 14,000 acre ranch. Lance and his wife Sunshine have added the bloodlines of Dancin Rooster, a bay "Son of Champions", stallion. Dancin Roster bloodlines include: own son of Gallo Del CIelo, Peppy San Badger, Boonlight Dancer, Peptoboonsmal, High Brow Cat & Doc Bar. Our stallions also include: ID Watch Two Eye, a bay roan son of ID Watch by a daughter of Two Eye Red Buck. Set Em Up Bartender, a bay roan stallion out of Two Eyed Bartender. West River Blue and Blue Stars Fire are both home raised stallions that are 3rd generation blue roans of Joe Quincy bloodlines. Lance and Sunshine take great consideration in choosing their breeding stock with the American cattlemans' interest at heart. We strive to produce great looking, gentle minded, tough horses made for the hills. Rod, Kathryn, Lance, Sunshine have strived to breed horses that work great in the arena, on the trail, or when working with cattle. The Froelich's believe in producing horses with performance ability, cow sense, eye appeal, color, but most importantly disposition. Froelich Quarter Horses have been purchased by cowboys and cowgirls across the North American Continent. Renowned horseman, Buck Brannaman rides one of their horses as he travels the world performing clinics. Lance and Sunshine have also been donating horses to the Montana State University Horsemanship program for the last 5 years. Lance and Sunshine sell directly off the ranch with NO annual sale and have horses of all ages to choose from. 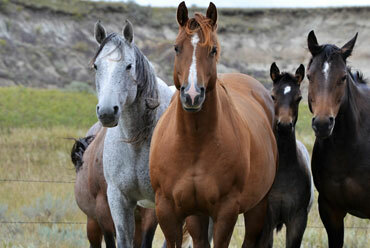 The foals sell on a first come, first serve basis and may leave the ranch after weaning in September. We welcome you to view the horses on the web site or in person at the ranch. Please contact Lance or Sunshine at 701-422-3630 (h) or 701-390-0030. Froelich Quarter Horses. So good you can’t just have one! They get along with everybody! I got my first Froelich filly in the spring of 2015. I liked her so much that I got a yearling filly from them in the spring of 2016. Brains, beauty, athleticism and quiet dispositions--they're the total package. Love my Froelich girls! We have really enjoyed the horses we have from Froelich ranch. I got my first three horses 4 or 5 years ago. We went out to their ranch to pick them out. Wow, what a great operation they have. Their breeding program is excellent. The colts I picked out were awesome, very good minded, paid attention to me, and learned quickly. They were very gentle, and it wasn't long before I was swinging a rope off them, and taking them branding.I liked them so much Lance has brought two more out to me since then. I highly recommend the Froelich Horses. You cant find nicer, and more honest people to work with than Lance and Sunshine Froelich. We approached Froelich Quarter Horses because we were looking for two year old prospects to ride and later sell. Froelich Quarter Horses helped us by providing a large selection of horses. The result was two big roan geldings with great conformation and pretty heads. One thing we liked was their great hospitality. Lance and Sunshine took the time to help us find the perfect horses. We found the experience relaxing and fun. We would recommend Froelich Quarter Horses to people who need to find that perfect horse. I bought my first Froelich horse in 2010 the gelding is now my top horse and will be handed down to my daughter. I now own 5 Froelich horses and they are all kind gentle horses that are ranched on. 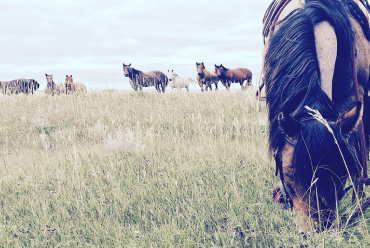 These horses have the bone and confirmation to cover the country we have in Easter Montana, but also have the right disposition so the whole family can enjoy them. Lance and Sunshine are doing a wonderful job raising big boned, flashy colored, and most importantly GENTLE horses. I had a few clients send me Froelich horses to start over the past few years and liked them enough to want one of my own! I'm am really proud of the two year old Bay Roan gelding we bought. He will be big enough to rope a cow and gentle enough to take care of my little boy one day! Lance and Sunshine have been personal friends of mine for a number of years. Over these years I have been impressed by the consistency of their horses, especially the quiet and willing minds of the Froelich horses. Buyers may be drawn to the beauty, but its the mind that counts. Sheri and I purchased our first Froelich horse in 2011. We were so impressed that we traveled 1700 miles to meet and check out Lance and Sunshines's ranch and horses. We have purchased 3 more horses since. 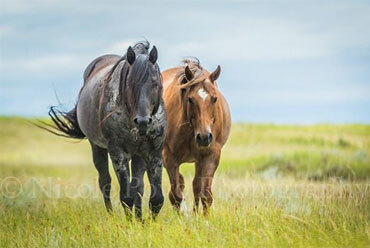 These horses are foundation bred, having the want to learn, quiet, dependable, and are great trail horses. They are also good to look at. What great quality horses we have. Lance and Sunny are good down to earth honest people. What I would say is they are just "good people"! Each visit their hospitality has always been top notch. Sheri and I cannot say enough about our experience with Lance and Sunny. I have been starting horses for myself and for the public for twenty years. In that time, I have worked with many breeds and bloodlines and have experienced a full range of temperaments. I have worked with Froelich raised quarter horses the past 9 years, from weanlings to maturity. What I have found is that their horses consistently display an impressive aptitude for learning, excellent temperaments, solid conformation, beautiful color, athleticism, eye catching movement and overall eye appeal. These horses are a pleasure to be around. They have a lot of feel and they have a natural steadiness about them, which has made them very dependable in a working situation. We visited the ranch and purchased a couple horses for our prospect program. I am pleased to say that, we like them so well that they won’t be for sale anytime soon. Thank you for raising such nice horses Lance and Sunshine! North Dakota is a long way from California. But not too far to go for solid horses with gentle natures, willing attitudes and that most prized attribute, “a good mind”. Wow, what a difference it makes! Youngsters raised outside in the open know how to handle themselves in a herd and over varying terrain. I couldn’t be happier with the horses I’ve bought from Lance for myself, clients and friends. Plus Lance and Sunshine are the best! Without hesitation, in fact with great enthusiasm, I recommend. The first horse I saw from Froelich Quarter Horses was "Big Swede" owned by Buck Brannaman, a nice big horse with a really good mind of course it was ridden by Buck. A year later I met Sunshine and Lance during a colt class in California. We rode together and they were the nicest people. A friend of mine who is looking to purchase a colt looked all over the place and decided to get one from Froelich...a 2 year old filly. After starting the Filly, a few months later she came to our house to go on a trail ride with us and have the support of one of our older horses. She was a cute roan and was acting like seasoned trail horse. That night I sent some pictures of the filly on the trail to Lance and joked about getting myself one for myself. Of course, he took it seriously and sent me a picture of a blue roan that I couldn't say no to. A few months later I drove to Dallas Forth worth to pick up 3 horses 2 for me and a second filly for my friend. Sunshine and Lance are doing an incredible job producing some affordable solid-minded and very attractive horses. They are trustworthy people, which is a rare thing in the horse world. On one hand I wish they live closer, but on the other hand... I would probably buy a horse every year. I'm a verified purchaser. I have purchased a few horses from Lance and Sunny. Their horses have good minds and are well put together. My vet comments on how well they are put together each time he sees them (good bone and feet). On top of that, they are pretty (or handsome) to look at. I get compliments on them every place we go. It’s hard to find looks and a good mind – but that seems to come with each of their horses. These horses just seem to want to please you. Each day they look you up once you get in the pasture. I’m excited to see how my newest addition starts this next spring. © 2018, Lance & Sunshine Froelich Quarter Horses. All Rights Reserved.